Khnum - God of creation and the waters. - Egyptian God. Khnum is a God of creation and the waters originally the god of the source of the Nile River. Home ¦ Divinity of the Day ¦ Egyptian Gods and Goddesses ¦ Khnum - God of creation and the waters. Khnum - God of creation and the waters. Khnum is a God of creation and the waters, originally the god of the source of the Nile River. He is said to have made manking from clay from the Nile on a potter's wheel. 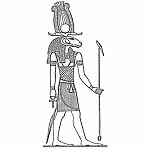 Khnum is the third aspect of Ra. He is the god of rebirth, creation and the evening sun. His main cult centers where at Elephantine and Esna. He was usually depicted as a ram-headed man at a potter's wheel. A Morning Hymn to Khnum, which served to awaken the god in his shrine, can be found at the Temple at Esna.